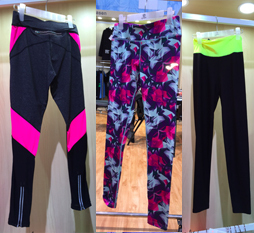 There are many styles of fitness pants. Every pair of professional fitness pants has a specific function. Based on the intended usage, the materials and key features have to be chosen. Key features include fabrics as well as the product design. Different materials have different characteristics. Cotton for example is breathable, water-absorbing and warm. Once wet however, the material is heavy and can lead to chafing. Fitness fabrics should be chosen based on the user’s requirements. Clearly defining the proportion of each material, helps factories to better understand your needs and achieve the required characteristics. Sweat-wicking materials keep you dry and comfortable by moving sweat away from your skin to the outer layers of your clothes, where it quickly evaporates. A key factor is the fabric’s weight. Material weight is communicated in grams per square meter GSM. Common woman’s running tights made of polyester, generally have an average weight of 260GSM. Top fitness brands have years of experience as well as top notch fashion designers and material researchers to develop high end sports pants, that meet the demand of today’s sportsmen and women. When working with our partner-factories, these multinational fitness brands give very clear instructions on the designs, fabric combinations, constructions and packaging. 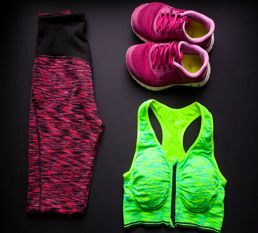 Brands which are new to the fitness clothing segment, often have difficulties communicating their preferred fabrics and styles. To ease young brands’ development processes, we have summarized key points of published information from top fitness clothing brands. Men’s tights are made of 88% polyester and 12% spandex.